I've been trekking back and forth across campus between two offices since the beginning of the month, after my department moved to a new building. To one office for the position I recently received a promotion to and another office for a position on a once-in-a-lifetime project I had the opportunity to join. Lately I've been staying in one place which is the farthest away from the new building adjacent to the gym located conveniently next door that I go to every weekday. But I'm needed in both offices until my replacement is hired which could be several weeks so I may be walking around for a while. You see, walking is not the problem; it's hauling my six-pound computer bag and accessories, gym bag, lunch bag and purse across campus in the Vegas summer heat while wearing heels is the problem. That was getting really old! Despite planning the logistics of my day, I find myself spending a lot of time just getting to and fro. Today, my husband picked up an eZip E-500 electric scooter for me. 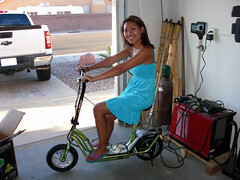 500W of power that can get up to 15 mph and go as far as 8 miles on one charge! This thing will be easier to load in the trunk of my car and zip across campus (it's 60 pounds but I've been lifting weights) and I can leave my bags in the car or office because getting to them will be a cinch. This also means (drumrolls, please) more time at the gym!! 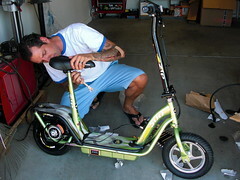 I came home to find him assembling the scooter as a surprise (one of the reasons I love him so much; he's always doing this stuff for me). We'll need to install a basket or rack on the back fender so I can bungee my bags to it. 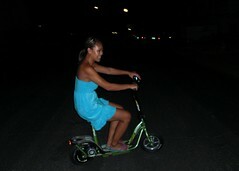 Then I tried it out for size (but not able to ride yet until the scooter is fully charged.) Now all I need is a fan in my face to blow the hair around my head! By evening, my scooter was charged and ready to go. I couldn't resist taking it out for a ride! 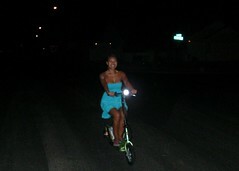 We had fun zipping back and forth across the street...LOL. That little thing can sure book it!! My husband decided after a while to stand on the scooter for an alternate way of riding. I'm glad he didn't crash the scooter; leave that for me to do! I don't know if you spotted that big bandage on his elbow in the first photo. 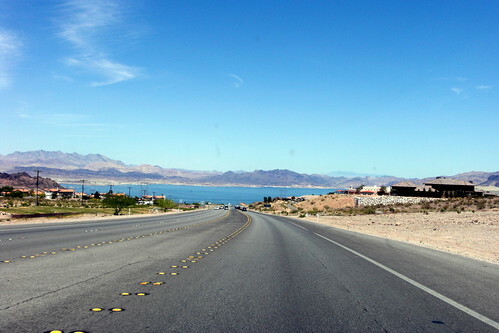 On Sunday, he was coming down this freeway in Boulder City (pictured below) which goes by Lake Mead. He was going about 45 mph as he slowed down to turn towards his parents' home (where I was staying with our cats because our A/C unit broke down and was waiting to be replaced). As he turned, his bike came out from underneath him and he along with his bike went sliding across the oncoming lane. The day was getting warmer so the oils surface on the asphalt and road bike tires have no traction whatsoever so the road was very slick. Had the curb not stopped him, he would've skidded into the dirt. He arrived home with road rash on his arm, left thigh, cuts on his palms (he did not wear gloves that day). The road grinded through his shorts and the buckle of his shoe. His bike and pedal suffered minor scratches. Besides that, he was okay and very fortunate he only had minor injuries. Lesson learned: it wasn't if he would crash but when. Never in his competitive junior cycling days did he crash. Now he has the marks to prove his first fall. I inserted links because the photos are kind of graphic (I've seen them enough helping him clean his cuts...LOL). 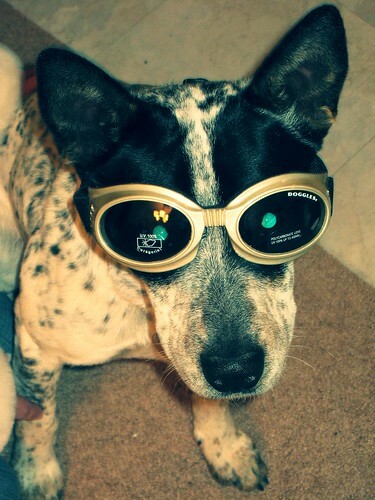 You are stylin for sure now! Congrats on the new ride. Just be careful not to biff it like hubby did. :) Hope he heals fast, definitely looks like those suckers hurt. Thanks, tombocheck. I'm not the most graceful person on a bike so I hope I don't crash. At least I don't have a long way down on the scooter. John was in a lot of pain the past few days (I think because of the bruise on his thigh). He's getting worse before he can get better. Annejelynn, I'm glad I was able to help and I'm so glad you thought to call me. Anytime. 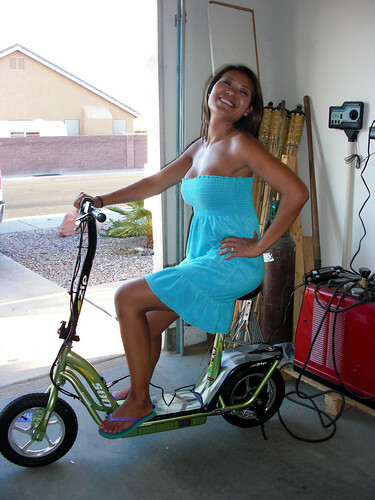 I am very close to purchasing one of those scooters (the EZip 500) at my local Walmart. There are very few reviews of it on the web, and yours is certainly the best. It has been several months since your blog post. How have your experiences with it been since then? It was easy to assemble (my husband would say since he did it), after charging over night I was ready to go. As you know the handle folds up and I can fit it in the trunk space of my car (VW Rabbit) with the seats folded down. The scooter really moves, I think I've come close to its full speed of 15 m.p.h. I know I've passed golf carts around campus. It is a very sturdy scooter, especially for the price. I can ride from building to building to building and then back to my desk and charge. I always charge the scooter whenever I am back at my desk; it runs best that way. A month ago, we put more air in the tire and greased the chain and this baby really flies now! It runs quieter (the scooter makes a whizzing sound that is normal) and smoother (because there's more air in the tires). At times if I slow down to a stop, it stalls so when I throttle it doesn't go and that is normal (the manual mentioned this). It doesn't happen all of the time but I just reset it by turning the power on and off. I use to take the scooter home but got tired of lugging the 60 pounder in and out of my car so I leave it locked up at work. Avoid keeping it in extreme heat (I left it in my car for an hour during the summer in Vegas) because that will drain the battery. 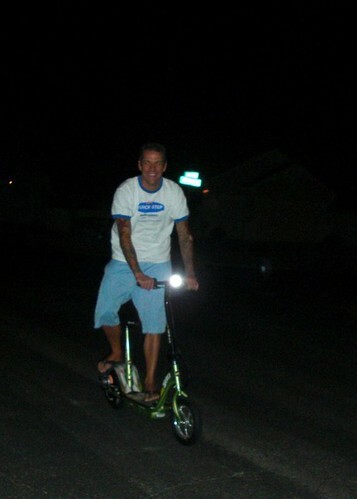 I still LOVE my scooter and am so glad I got it. I hope you are just as happy with yours. Let me know your thoughts when you get it! @ Anonymous: I think the seat is higher than 2 feet when measuring from the bottom to the top of the seat but I can tell you for sure on Monday (I keep my scooter at the office to get around campus). You can also email a friend of mine, Chris at lcbarnas@ptd.net to find out for sure. If you decide to order from his site: www.ScooterFamily.com, he can give you a code to enter at checkout for 20% off if you email him first. 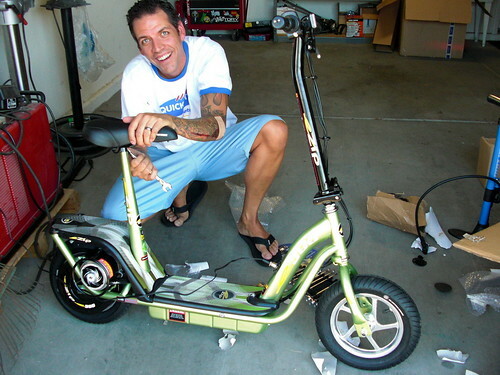 It is a strong scooter, it can push my bum and 50 lbs. backpack--pretty fast. I have not crashed yet (knock on wood) and strongly encourage the use of a helmet and body pads for young adults. Good luck and let me know what you think if you get one. @ Anonymous: I put two sheets of 11 1/2" paper next to my scooter and the seat is well over 2 feet. I'm sorry :( My guess is it's around 2'6" at the least. It doesn't look like the seat is adjustable but you do have the option to not install the seat so the rider will have to stand (like John did in one of the pictures). I don't have enough balancing/coordination skills to stand so I have to have a seat. I wound up doing some crazy stuff to my E500. I got rid of the electric engine and replaced it with a gas engine, so now it goes like 35 mph. But its not much use to me right now because the tire blew out! XD! I bet that must be fun to go 35 mph!!! It already feels fast on mine which I think goes 15-18 mph? I may need a new battery soon since I left my scooter outside on a hot day this summer, it drained the battery and doesn't go as fast as it did before.